Continue reading after the jump to access my original review of “24: Season Six” on DVD. May 2006. Season Five of 24, arguably one of the show’s best years, had just ended in the biggest cliffhanger in the show’s history. Jack had just been Shanghaied to China by a really angry Chinese Government official who he’d ticked off in Season Four, set for months, even years of torture and interrogation. 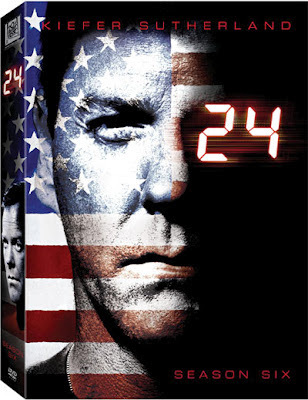 I think the main reason this was such a great cliffhanger is because any fan of 24 is a fan of Jack Bauer, a man who is a hero for today’s times. He’s a real human, with real problems, and is also a genuinely good guy, which is what makes 24 one of the best show’s on TV. The writing, direction, special effects, etc. would be nothing without the character of Jack Bauer and the man who portrays him, Kiefer Sutherland, who is continuing to give one of the best performances on TV, and has been nominated for an Emmy six years in a row. So even though Season Six of 24 (the one that has been bashed every way possible) may be the show’s weakest year to date, it’s still up there with some of the best stuff on TV, simply because of Jack Bauer, and the amazing performance that brings his character to life. Picking up twenty months after Day 5, the US is being rocked by a series of terrorist attacks, and has been for the past three weeks. Turns out that a man named Fayed is willing to give the US the name and whereabouts of the man believed to be behind these attacks...under one condition. He wants Jack Bauer. President Wayne Palmer (David’s little bro) negotiates with the Chinese to bring Bauer back, just so he can die, hopefully to stop the attacks. As soon as Jack arrives in the states, scarred, dirty, and hairy, he’s ready to sacrifice himself for the good of the nation. Here lies one of Jack’s greatest character moments in the whole series, when he explains why he’s happy to die for this cause; if he dies here, now, he’ll be dying to save people, dying for something. If he’d succumbed to torture in China, he’d have died for nothing. The scene in which Jack explains all this is riveting and should have given Kiefer Sutherland the Emmy. Anyway, Jack soon learns this is all a double cross, and soon, when the unthinkable happens, he’s again on the front lines, tearing up every possible lead, even when it involves his own family, to find the terrorists and stop what would undoubtedly be the worst attack on US soil ever. Yes, I’m talking about nuclear bombs. Sound familiar? Anyone who’s watched 24 knows its there go-to plot point when they can’t think of anything else. For the record, nukes have been the key plot points to all the even numbered seasons, while the writers stayed pretty creative with the odd numbered seasons. The nuke story is only one element that makes this season feel like a sorry retread of past adventures; sappy love stories, CTU soap opera drama, terrorists invading government buildings; nothing in this season is original. You’ve seen most of it, and most of it done better in past seasons. But once everything’s done and you can look back on it, this is, overall, a fun season that, while is undoubtedly the show’s weakest, is still 24, and is still a few notches above most programming these days. The supporting cast is not as strong. Returning players Bill Buchanan, Chloe O’Brian, Karen Hayes and Wayne Palmer are all strong in their respective roles. Is it a bit unbelievable that Wayne would be elected 1 term after his brother? Maybe. But he does a good job showing the mental instability that comes from having a great man as a President, and it nice to finally see someone who supports Jack in the White House again. This year’s MVP of the supporting cast, however, is Peter MacNicol as Tom Lennox. Palmer’s Chief of Staff, Lennox is a great character; angry, jealous, and manipulative, he comes to learn what many politicians need to know; that getting along can get a lot more done that fighting over policies. Eventually, he ends up being a bit of a hero, and his transformation is deep and interesting. New characters Nadia Yassir and Milo Pressman (he had a guest part in Season One) are some of the worst characters ever seen on this show, and some of the worst written. Milo actually is set up for some interesting plots that are thrown away, and Nadia is just whiny and annoying the entire time. A romance tries to blossom between the two...but it just ends with a bullet in the face for one of them in a total “What the...” moment that you forget about by the next commercial. Sandra, Wayne Palmer’s sister, is just as annoying, and serves as a weak character in a few pointless plots. James Cromwell plays an effective villain as Jack Bauer’s demented father; while he may look nothing like Jack, he acts a bit like him; a Jack who went to the dark side, if you will. So while season 6 is a much weaker season than we’ve come to expect from 24, it still delivers the good in action, exciting cliffhangers, and some unbelievable character moments on Jack’s part, up to the tear-jerking finale that defines Jack as a character and leaves us all on an emotional cliffhanger. As always, 24 delivers a solid DVD set. Spread across 6 discs, the video quality for all 24 episodes is even, and is overall quite good. Having originally watched this on the HD broadcasts, standard-def DVD was definitely a step down, but much of the sharpness and detail of the image remains. Blacks are deep and colors, often somewhat muted for dramatic effect, are accurately represented. The image sometimes gets too dark to see detail, which can be annoying, but overall, the image should please fans. If you watched this on regular TV, not HD, this is definitely a big step up. The audio is about on par with the HD broadcast version. Dialogue takes main stage most of the time, with the powerful musical score having a constant presence. Sound effects never overpower, except on the ticking clock before and after commercials, which is so strong it made my speakers buzz. The extremely low bass in some parts, like the clock, is one of the only flaws in the audio. Extras are a bit weaker then they’ve been in a while, but still provide some good information. There are commentaries on about 10 episodes, and while I haven’t listened to them yet, I know the ones on past seasons were very good. Deleted scenes are present on most episodes, and you can watch them via branching on the episodes or as one big package on disc 7. All together, they run about 25 minutes. There are commentaries on them that are fairly weak, but the scenes themselves are interesting. Some featurettes on disc 7, one about the writing room, one about making the premiere, and one about special effects are all fairly boring and uninformative, though your preference may differ. There’s also some interesting “mobisodes” (mini-eps made for cell phones while the season ran). The feature I’m sure everyone wants to see is the much advertised Season 7 preview....don’t get your hopes up. It’s fifteen seconds of clips from Day 6 with a voiceover saying “What will the next day bring? 24—Season 7—Coming in January (which is won’t be doing due to the WGA strike).” There. I just saved you fifteen seconds. The funny thing is, there is a three minute official preview on the internet, so I have no idea why they went with this little announcement promo. Finally, there’s a preview of the premiere episode of season 2 of Prison Break, and preachy and fluffy PSA by Kiefer Sutherland. I don’t need actors preaching to me about the environment and what not. It’s silly. So, in conclusion, this is a solid DVD set of a weaker season, but I’d still recommend it for 24 fans. Anyone just getting started with the series; start at Season one, episode one, and never skip an episode. You’ll be lost.